Set sail on an incredible journey with Jonathan Swift's satiric masterpiece. 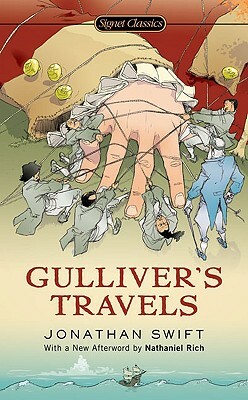 A fantastical tale, Gulliver's Travels tells the story of the four voyages of Lemuel Gulliver, an English ship's surgeon. First, he is shipwrecked in the land of Lilliput, where the alarmed residents are only six inches tall. His second voyage takes him to the land of Brobdingnag, where the people are sixty feet tall. Further adventures bring Gulliver to an island that floats in the sky, and to a land where horses are endowed with reason and beasts are shaped like men. Read by children as an adventure story and by adults as a devastating satire of society, Gulliver's Travels remains a fascinating blend of travelogue, realism, symbolism, and fantastic voyage—all with a serious philosophical intent. Includes thirty illustrations by Charles Brock and five maps of Gulliver's journeys. Jonathan Swift (1667-1745) was born in Dublin, Ireland. From 1689 to 1699, he worked as secretary to Sir William Temple in Moor Park, Surrey, England, returning for a short period to Ireland in 1694, where he was ordained an Anglican priest. It was during his stay in Moor Park that Swift discovered his talent for writing satire. From 1708 to 1714, much of his time was spent on ecclesiastic missions in London, where the brilliance of his political pamphleteering earned him the respect of the leading governmental figures of his day. For the remaining thirty-odd years of his life, he served as Dean of St. Patrick's Cathedral in Dublin. During this period he wrote Gulliver's Travels (published in 1726) and went on to become a national hero for defending Ireland against the inequities of the English Whigs. Leo Damrosch has taught at the universities of Virginia and Maryland and at Harvard University, where he is presently Ernest Bernbaum Professor of Literature. He has published books on such subjects as Samuel Johnson, Alexander Pope, William Blake, and the eighteenth-century novel, His biography Jean-Jacques Rousseau: Restless Genius, was one of five finalists for the 2005 National Book Award in Nonfiction, and won the L. L. Winship/PEN New England Award for best work of nonfiction. Nathaniel Rich is the author of the novel The Mayor’s Tongue. He is the senior editor of The Paris Review and has written for The New York Review of Books, Vanity Fair, The New York Times, and Slate, among other publications.